The two books that I enjoyed this week remind me of what a wonderful time it is to be a comic book reader. It also reminds me of the diverse offerings that readers have and how they appeal to such a wide variety of individuals. On one hand, Saga has one of the most diverse cast of characters that many people will be able to relate too. It is a series I often recommend to people who are considering joining us on the dark side. On the other hand, Teenage Mutant Ninja Turtles is a throw back to the classic comic book and one that can bring in old school fans. It doesn't pull any punches and manages to deliver a solid story with some high octane action. Teenage Mutant Ninja Turtles Universe #1 - I recently discovered how good the IDW reboot of this series actually is and am almost current! I saw that anew series was debuting this week and I had to check it out. Taking place after the events of the main series (I was spoiled a bit and am ok with that), there is a new threat to the turtles and some new mutants to boot. A lot of new series like to ease you into things, but this book puts the pedal to the metal as the turtles are helping April try to connect with Stockman to figure out what sounds like ancient mutants. There is a good sense of mystery and a strong threat facing the turtles as they embark on a new journey. Kevin Eastman still has his influence on the series and writer Paul Allor, artist Damiam Couceiro, and colorist Ronda Pattison do a great job maintaining the gritty and dark feel of the original series. After watching a lot of the new cartoon with my son I am quickly reminded of the dark origins of the turtles. Saga #37 - While I have to hand it to Brian K Vaughan for his incredible ability to create massive universes, Fiona Staples does a phenomenal job making art that is both incredibly shocking on one page somehow fit with art that is incredibly cute a couple of pages down. Her ability to provide the visuals for this series and the diverse set of characters, technologies, worlds, and story lines is nothing short of amazing. The crew's attempt to make it to Squire is cut short as a malfunction in the tree ship is forcing them to land on a potentially hostile comet. It seems that there can be no peace for these characters as they strive for a sense of normalcy. What is discovered on the comet, I have a gut feeling, is likely not what it seems. 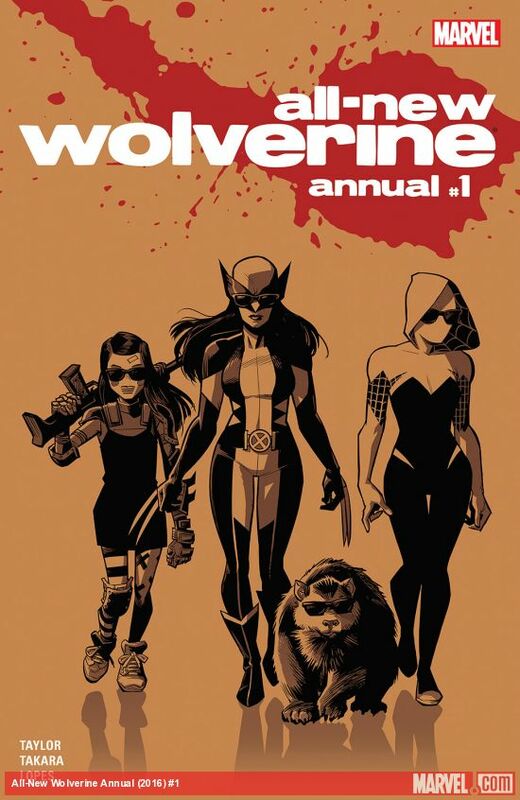 All-New Wolverine Annual #1 - I'm not the biggest fan of annuals, but wanted to read more about the new Wolverine. If you didn't know, the new Wolverine is Laura Kinney, a clone of the deceased Logan. I've read a bit about her and want to check out the new series and was a bit let down by this issue. It isn't discouraging me from reading more about the new Wolverine and I think is more of a side-effect of the nature of the annual. It is a one-off story that tries to do a bit too much. In this story, Larua has traded identities and powers with Gwen Stacey. Toss in some interdimensional travel and revenge gone wrong and you have your one-shot. I remain intrigued by the new Wolverine and look forward to reading more of her adventures. It can only go up from here!